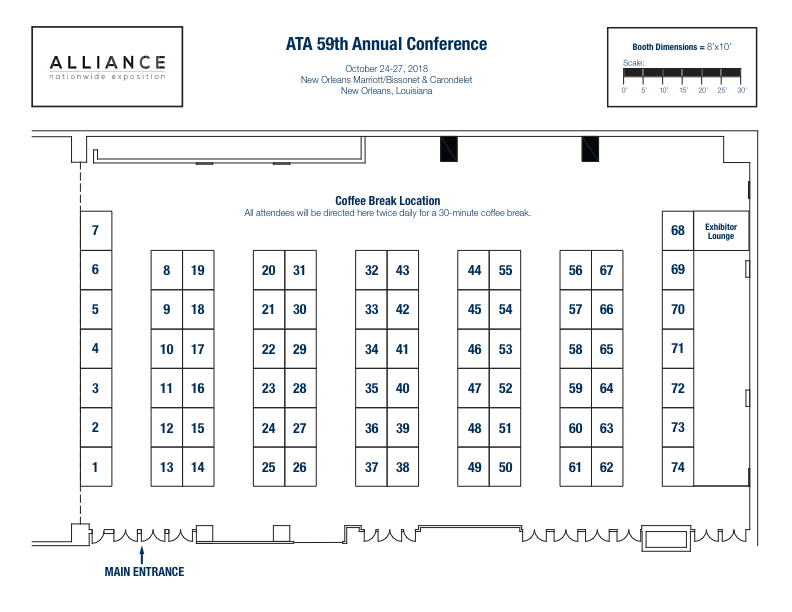 By becoming an ATA Exhibitor, you will not only be able to meet 1,600 attendees while you’re at the conference, but ATA will promote your company or organization to over 10,000 members BEFORE, DURING, and AFTER the conference! Your name and website will appear in the Final Program, given to every attendee as they arrive onsite. You receive one complimentary full-conference registration per booth so you can network with other attendees at sessions and events. Along with your registration, you are given access to the Conference App just like all other attendees. By completing your Attendee Profile, attendees can click to call or email you and you can do the same. You can also view attendee résumés, photos, and contact information. Your name and website will appear in the Conference edition of The ATA Chronicle, circulated to members in January. Your name, website, and 50-word profile will appear on the Conference Website, promoted to all members before and after the conference. Your name and website will appear in Newsbriefs, ATA’s e-newsletter sent to members monthly. NOTE: Booth staff may not attend sessions and events unless also registered for the conference. Not included: Exhibitors are responsible for ordering additional furniture, electricity, Internet (if a direct line is required), equipment, etc. Order forms for these items will be provided after deposit payment is received. Click floor plan below to view full image. To reserve your booth(s), a deposit of $500 is required per booth. You can also save 10% if you pay in full. Click to Rent Your Booth Now!